Until now, installing and maintaining optical networks required technicians to carry a variety of equipment which was not only cumbersome, but also expensive. 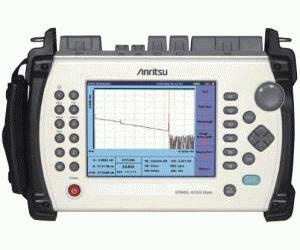 Hearing this common complaint, Anritsu engineers have developed its new line of MT9083A ACCESS Master OTDRs. MT9083A test sets are designed to make your measurement experience simple and error-free with true one-button fault location, pass/fail classification, automated file saving and naming and even a macrobend detection feature for identifying installation issues.Ü They feature multiple wavelengths and options to satisfy any network testing requirement: access or metro, FTTx or LAN all without straining your budget. For customers installing and maintaining metro area or access networks, the ACCESS Master offers an automated fiber construction application and multiple wavelengths including specialty applications such as 1383 nm for certifying legacy fibers for CWDM upgrades. The ACCESS Master MT9083A is the first all-in-one tool that does not compromise performance. It features extremely high resolution to see those closely spaces splices and connectors, while still being able to certify 100+ km spans- quickly and accurately.Ü In addition to verifying the integrity of the fiber plant, network performance can also be verified ensuring the customer experience is at its highest level.